There are some general volleyball attire rules for your team's uniforms that are being enforced by attentive referees and game officials. Some of these rules are well known and others ...not so much. I review a few here so you become familiar with them and hopefully avoid any future uniform violations called against your team. According to the USA Volleyball Ref Training manual the volleyball uniform is considered "equipment." 4. 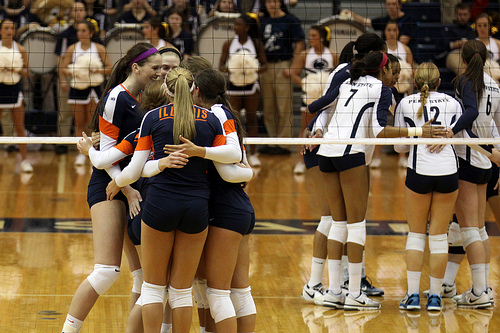 All team members, must wear the same design and same color and the uniforms must be clean, with the exception of the libero who wears a uniform with contrasting colors. 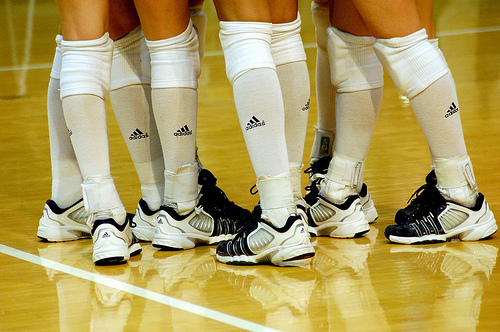 This seems like one of the simplest general volleyball attire rules for the lower body part of the uniform but did you know that for USA Volleyball neither the socks nor the shoes of each player on a team need to match? 5. Although they are considered an important part of your volleyball equipment socks and sports shoes are no longer considered a part of the uniform. Another example would be in case all players on a team are wearing Mizuno volleyball shoes and one player is wearing a different brand, like Asics volleyball shoes, since this is allowed, the team will still be able to play, regardless. 6. Did you know that members of your team are not allowed to put a zero in front of any numbers less than ten (10) on their jersey? USAV 4.3.3. in the USAV Referee Training Rules for Indoor Volleyball Handbook states that player's jerseys must be numbered from 1 to 20. So, if you're a team captain or coach that is facing an opposing team with players that have jerseys with numbers that are less than zero but are printed with a zero in front of them like "09" or "03" you would be right as a coach or a team captain to point that out to the referee as being an illegal number. 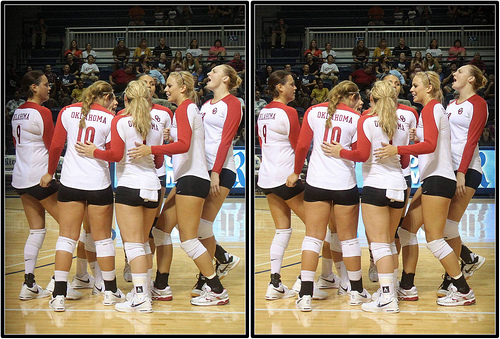 Volleyball Attire Rules: The Oklahoma Sooners team in their uniform jerseys and spandex shorts. Players with uniform numbers that are zero to nine "0 - 9" must not have a zero as the first number on their jersey. So a jersey with the number 8 should never be "08" or a player with a "5" on his or her jersey can never sport a jersey printed as "05" on their uniform. In other words, numbers less than ten should be printed on a player's volleyball jersey as a single digit. And that also means that a jersey with "00" on it would be an illegal number as well. If you're a coach ordering new jerseys don't plan on allowing any of your players to wear a jersey with a double zero on it. 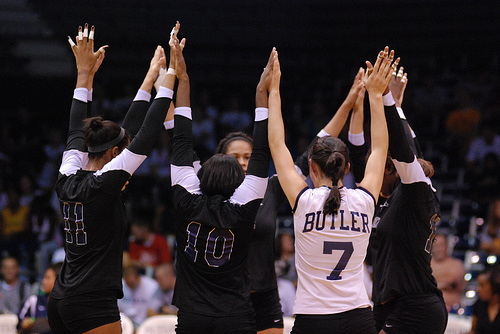 With the growing popularity of arm and elbow sleeves, one of the general volleyball attire rules allows for teams to have one of more players wearing them without penalty. 7. USAV game rules state that "any undergarments worn by two or more players must be the same color and must "be similar." Here's an example, let's say a team has a middle blocker with a long sleeve white t-shirt underneath her jersey because she's still recovering from a cold while everybody else on her team except the setter is wearing their usual 3/4 sleeve jerseys with no undergarments peeking out from underneath any of their sleeves. 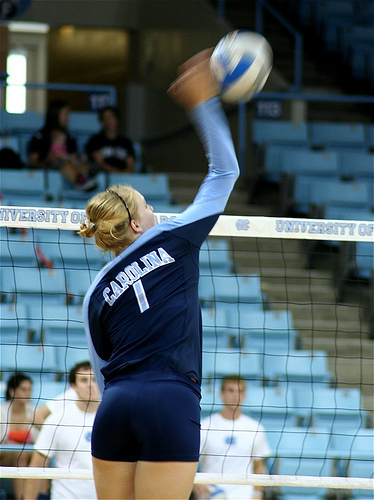 In this case, a second player on the same team, the setter was wearing a t-shirt underneath her jersey, then according to a general volleyball rule created by USA Volleyball she would be obligated to wear the same color (which is white) and style (which is long sleeve) of undergarment as her middle blocking teammate has on. 8. Jewelry is not allowed on the court. Drop earrings, are a definite no-no but even stud earrings are not permitted. According to Rule 4.5 under the "Forbidden Objects" section of the USA Volleyball Referee Training Indoor Volleyball Handbook USAV 4.5.1 states "A junior volleyball athlete participating in a junior event may not wear jewelry." Some players try to get around this rule by putting tape on top of their earrings to cover their ear lobes, but this practice is not permitted. The only exception is made is for religious or medical medallions which must be removed from their chains and must be taped or sewn under your uniform. so they don't cause injury to themselves or someone else.